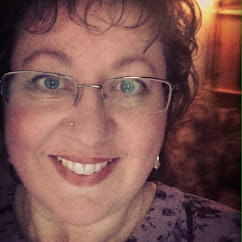 Edain Duguay: New book release on The Day of the Dead! New book release on The Day of the Dead! 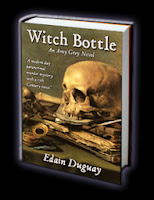 I'm pleased to announce that Witch Bottle will be published worldwide on the 1st of November 2014. The day is otherwise known as 'The Day of the Dead' and is rather appropriate for this story, which is the first book of The Amy Grey Novels. 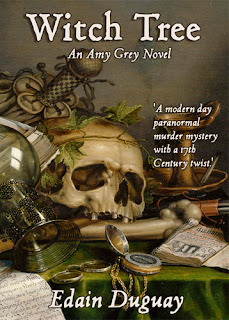 A modern day paranormal murder mystery with a 17th Century twist. After a family tragedy, Amy Grey finds herself in a foreign country emptying her parent’s belongings from their summer cottage. The cottage, however, feels strange and Amy is certain someone or something is watching her. Quickly, Amy slips into everyday life of a small town which, unbeknown to her, is haunted and conceals a serial killer. Bodies pile up because the Police have no leads, nor any evidence to pursue, nothing except a rare Witch’s Sigil. As usual, this book will be available as a paperback and an ebook. Also, a tree will be planted, in a deforested area of the world, for every copy sold in either format. To celebrate this release, there is a giveaway competition on Goodreads which ends on the 2nd November and, shortly, I will be announcing one on Facebook too.